Tikal is a phenomenal park, but for many families with small children visiting this UNESCO World Heritage Site seems intimidating. Perhaps it’s the sheer amount of walking and climbing. Maybe it’s the journey into Guatemala. Or possibly the thought of spending hours in the hot Central American sun with a little one in tow. 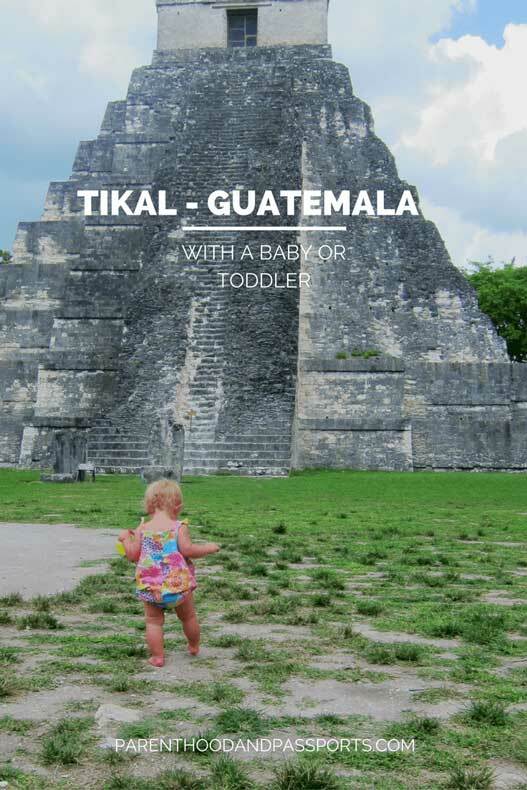 But, having visited the famous Guatemalan national park with our then 16-month-old daughter, I will tell you experiencing Tikal with a baby or toddler is definitely doable. 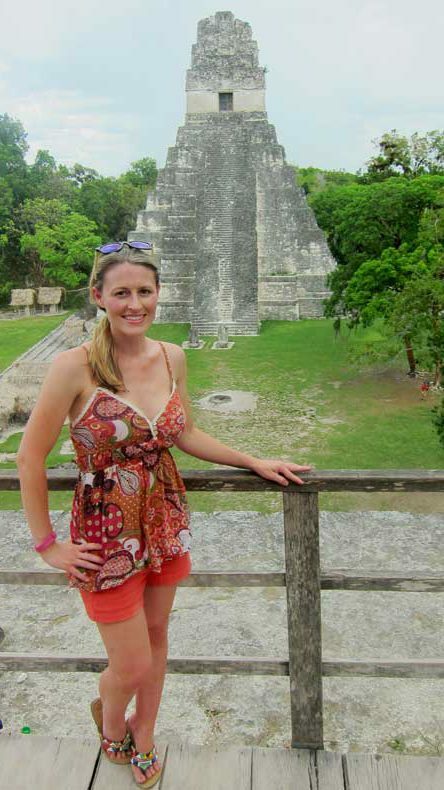 Tikal National Park is easily one of the top things to do in Guatemala. It is by far the most impressive ancient ruins sites we’ve ever visited. Tikal is in eastern Guatemala in the state of El Petén. It is approximately a two hour drive from the Belize border. 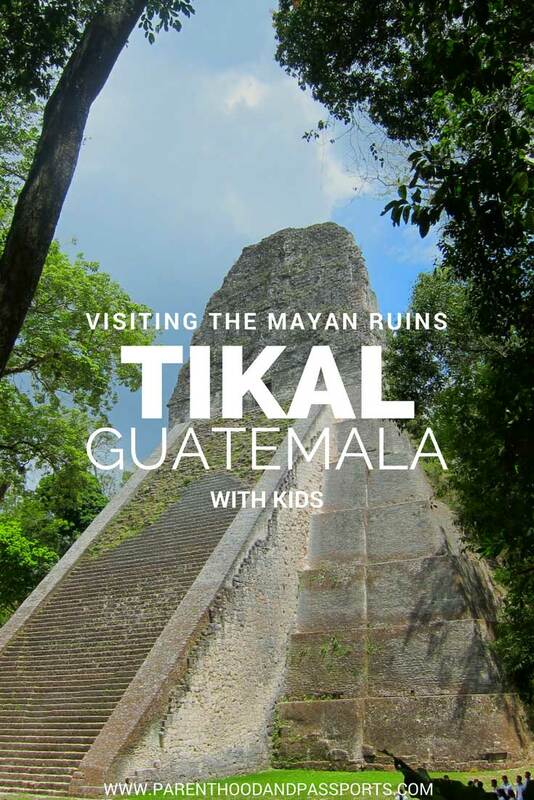 If you are planning a visit to Tikal while vacationing in Belize, we have written a step-by-step guide to crossing the Belize/Guatemala border to make it easy for you. Flores is the closet city to Tikal. It is about a 30 minute drive from the park. 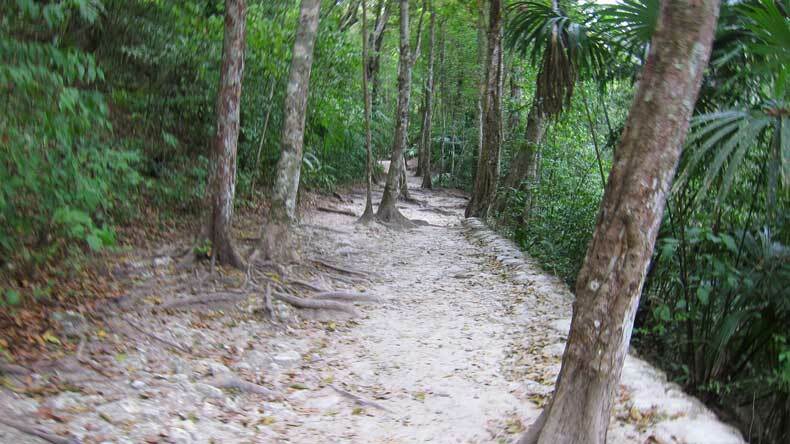 You can take a guided tour from Belize, but it is just as easy to drive yourself to the park. We drove because we didn’t want to share a minivan with others who might not enjoy our toddler if she cried. Plus, a self drive allowed us the freedom to stop when we wanted and be on our own time table. The park itself is massive. 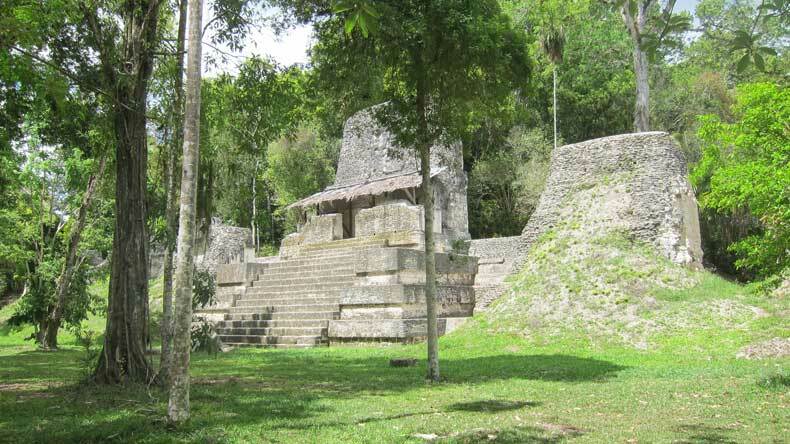 There are approximately 222 square miles of jungle surrounding the ancient Mayan City within Tikal National Park. 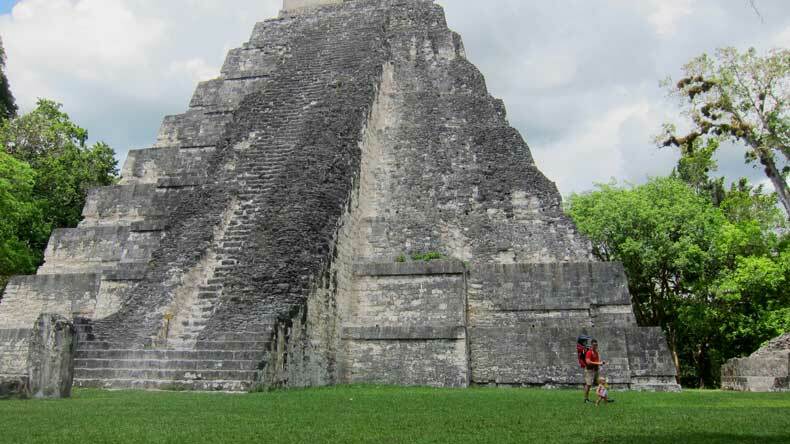 But don’t let that discourage you from visiting Tikal with a baby or toddler. The actual excavated site is much smaller and easy to hike. 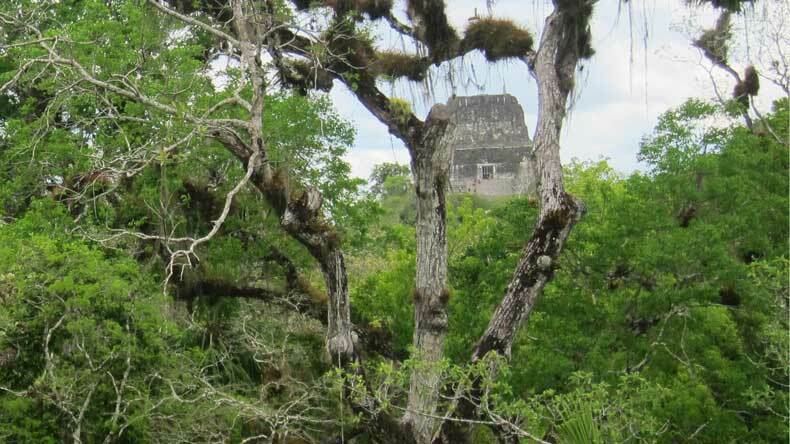 Much of Tikal remains unearthed. But the parts that have been restored consist of nine plazas. There are 5 big temples in the park, including two that face each other in the Grand Plaza. One of the most impressive and tallest structures is 230 feet high. The views above the canopy are spectacular. You can access the top by a staircase on the backside. To get to the top would be the equivalent of climbing about 4-5 flights of stairs. So if you are in good enough physical shape and have a baby carrier or hiking backpack, then it wouldn’t be that hard. However, I wouldn’t recommend letting young children or toddlers climb the temples without at least holding an adult’s hand. A slip could be very dangerous! Your other option, if two adults are traveling together with children, is to climb the temples separately. My husband stayed below and let our toddler run around while I climbed the temple. Besides the tallest temple, you can also climb one of the temples in the Grand Plaza by staircase. It is approximately three flights of stairs to the top. There is a great deal of walking required inside Tikal. In fact, to see everything, you will likely walk about four miles. From the parking lot, there is a short route that is slightly uphill that is about an hour walk to the Grand Plaza. There is a longer, flatter route you can take that goes by some of the other ruins, but it will take an extra thirty minutes. In all, we were able to see most of the temples and ruins in about 4 hours. We let our little one have some time to run around in the Grand Plaza, as well. Much of the hike is under a canopy of trees, and if you are lucky you might catch a glimpse of the monkeys hanging out above you. The shade is a welcomed relief from the hot sun and helps to keep things relatively cool. You will definitely want to bring some water for you and for your baby. 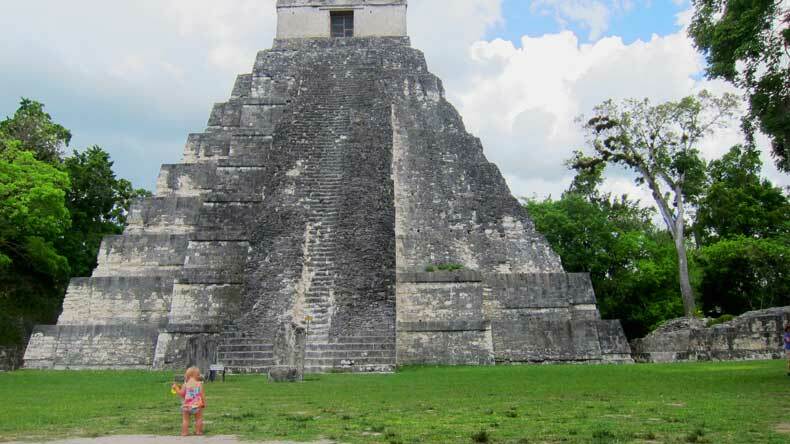 And while I let my daughter explore openly, keep in mind Tikal is in a jungle, so beware of insects, wildlife, and other possible dangers associated with the environment. Also, you are allowed to climb some of the ruins, but others have signs specifically stating not to. Please respect the park and the Mayan culture, by keeping your little climber off areas they shouldn’t be. To get a guide or not to get a guide? Everything I read said that the guides were worth the cost. We were quoted approximately $60 for the two of us if we wanted a guide. As much as I really wanted to know everything about the park, we opted not to take a guided tour. We weren’t sure how our daughter would do on the long walk, even in the carrier, and wanted to be able to move about at our own pace. Fortunately, she did great and could have probably handled the guided tour just fine. So really it is up to you. You will learn so much more about the Mayan culture, this ancient city, and the significance of each of the ruins you will see there, if you get a guide. There are a few signs up throughout the park that give some information, but not near as much as you would get if you take a tour. If you want more information on the history of the ancient city and it’s ultimate demise, check out this guide. There are a couple of restrooms and drink stations where you can purchase water around the park. The drink stations, I believe, only take Guatemalan currency, at least one we stopped at did. The restrooms do not have toilet paper in the stalls. Instead, you need to grab sheets of toilet paper from a small dispenser near the door before entering a stall. There are two restaurants and a gift shop located near the parking lot. These are the only places you can buy actual food inside the park. The drive from the gate of Tikal National Park to the parking lot is about 20 miles. It is paved and well maintained the entire way. A child carrier is a must with a toddler. A stroller would work too on portions of the walk, but the paths are dirt, and many of them have makeshift stairs or branches in the way. A hiking backpack worked wonders for us. Ours has a nice canopy as well to protect our little one from the sun, even when there was no shade. I’ve linked to it here. It cost us approximately $20 (US) to enter the park. We paid in quetzales (Guatemalan currency.) Our toddler was free to enter. The park hours are 6 a.m. to 6 p.m. for visitors who do not pay for the sunrise/sunset package. There are some hotels located inside the park if you choose to do a sunrise package. We did not stay in them, so I can give my opinion on the quality or value. Besides bottled water, you will want to bring sunscreen, good walking shoes, sunglasses, bug spray and wear breathable, comfortable clothing. There are some great places for a picnic if you want to eat under the shaded trees in the presence of the ruins. 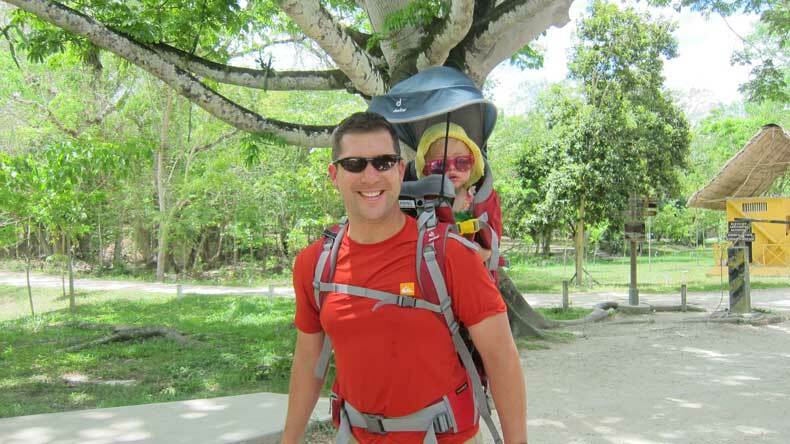 This is a popular option especially if you are visiting Tikal with a baby or toddler. You can bring food into the park, and if your little one is mobile, he can play and explore around you while you eat. 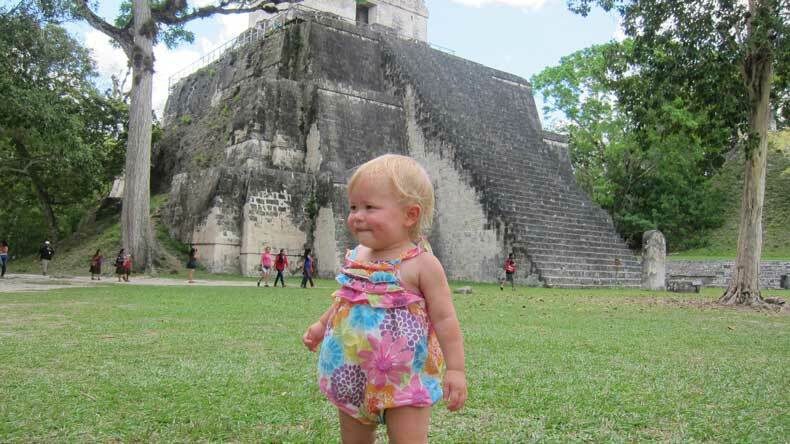 Have a question about visiting Tikal with a baby, toddler, or young child? We’d love to hear from you! Leave your thoughts in the comments below. Melissa, I think it is so awesome that you are able to travel with a toddler! 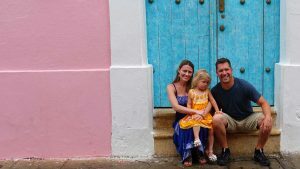 A lot of people think once you have kids, you have to stop traveling, and you’re proving that that is just not the case. This looks like a great way to take a toddler too as there’s a lot of room for them to run around. Looks like you had a great trip! It was a fun trip! And yes, we were told by so many people that we’d have to stop traveling once we had kids, but honestly, we travel MORE now that we have a little one. It’s a little more stressful with a toddler but definitely worth it! I am so totally gutted that we missed out Tikal whilst in Guatemala. We spent so long at Lake Atitlan we had no time to see Tikal before moving on. Everyone tells us how incredibly stunning the ruins and location are and your writing and descriptions really make me regret not visiting. Hope the mosquito’s weren’t too bad. P.S Your daughter is the cutest! Thank you! The mosquitos weren’t bad at all! We used spray to keep them away, but honestly we got bit more at the beach than in the jungle. One of the employees said that the bats eat the mosquitos and other bugs so it isn’t bad. Definitely put Tikal on your bucket list. It truly is stunning! i always thought that it must be so difficult to travel with kids, but seeing how you guys do it makes it look so easy! Love this! So glad that we aren’t the only ones traveling the world with our little one. Your daughter looks just like mine at that age (she’s 4 now). Kids are the best travel partners for sure! We love traveling with our daughter! It’s not always easy, but she is such a little sponge that she soaks up so much information. Travel is the best form of education! We have traveled with our kids since they were tiny newbies and it is always a wonderful adventure. This brought back memories of hiking in Colorado with us both carrying the littles. Our daughter was about two and rode in a carrier like the one you show here and our 7 week old rode in a front carrier. What fun times. Mine are much older now (10 and 12) and fantastic travelers. This looks like a neat place to visit! We hiked in Canada with our daughter in a front carrier when she was tiny too. She loved it and now loves the backpack! I truly believe starting them young makes kids great travelers as they get older. I have so many friends who stopped traveling after having kids. But having a child doesn’t have to mean giving up something you love, like traveling. The whole purpose of my blog is to prove to parents (and to people afraid to have kids because it would destroy their lifestyle) that it is possible to travel with children, and it can actually be really fun! Thanks for commenting and happy travels! This park looks amazing. My kids are all grown up now. My ‘baby’ is actually 21 today! I always travelled with them when they were little and there were challenges but if you want to make it happen you will! BTW you little girl is adorable! Thank you! I bet your kids love traveling now since you traveling with them as children. And yes, Tikal is absolutely breathtaking… a must if you’re ever in Central America. Holy moly your daughter is cute in that little romper!! Tikal sounds pretty amazing too 🙂 I’ve done a few Mayan ruins in Mexico – I think they’re so fascinating, both the history and the architecture. Will have to try to hit this one next time! Hahaha I adore your daughter in that last photo. She’s adorable! What a nice place to explore. People often think that cool adventure travelling stops as soon as you have kids but it’s really inspiring (and hopeful) to read that you haven’t found this to be the case. 🙂 great tips! Thank you so much! She is a fun little travel partner. Adventure doesn’t end after kids. It does change though. But if you are daring enough, it doesn’t even have to change that much. Hi! We are heading to antigua and Tikal with our 9 month old and 5.5 year old. Were you concerned about malaria for the baby? Did you use anything to deter mosquitos? Thanks for sharing! The mosquitoes weren’t as bad as we expected. We were told the bats in the forest eat the mosquitoes so it wasn’t that big of an issue as we were anticipating. We didn’t get bit once. Enjoy your trip!